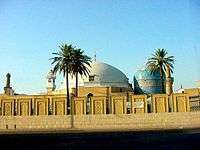 The Zahediyeh Sufi Order was founded by Zahed Gilani of Lahijan. As a precursor to the Safaviyya tariqa, which was yet to culminate in the Safavid Dynasty, the Zahediyeh Order and its murshid, Sheikh Zahed Gilani, holds a distinct place in the history of Iran. This article is issued from Wikipedia - version of the 9/23/2014. The text is available under the Creative Commons Attribution/Share Alike but additional terms may apply for the media files.